All funds raised will support the Skills Training programs at Chishawasha. Please note: Shipping in the United States is done via First Class mail (3-5 days) at $3.00 per item. Please contact us if you wish your items shipped faster; 2-day shipping is $25 for up to 2 items; add $4 per additional item requested. Please contact us if you wish an item(s) to be shipped outisde the U.S. These colorful and unusual necklaces were designed and created by the teenage girls at Chishawasha with a lot of love and assistance from Kathe. Materials include recycled glass beads (made and hand-painted in Ghana), seeds from the local Zambian markets, genuine, hand-crafted Zambian Malachite and Amethyst beads or chips. Because the beads are hand-crafted, there will be some irregularities. All necklaces are between 17" and 20" in length. Tan oval seeds with green or orange beads. Item # S-10. Hand-painted, hand-carved bone beads with dark oval seeds. Item # S20. Genuine Zambian Malachite beads with Amethyst chips. Item # A-20. Genuine Zambian Amethyst beads with Malachite chips. Item # A-21. Genuine Zambian Amethyst and Malachite beads. Item # A-22. The shopping bags are made of 100% cotton fabric, purchased in the local markets, and made by Mummy Naomi and the girls' sewing class; if your bag gets dirty, just throw it in the wash! Shopping bag, black with green and white wheat stalk pattern. Item # B-1. 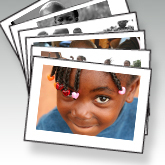 A selection of 6 note cards with photos of our beautiful children. Left blank on the inside, for your personal inscription. All occasion. Set of 6 with envelopes. Thank you! Your purchase is transforming the lives of orphaned children!